Protein is an important part of a balanced diet*, so we've created an easy way for you to enjoy more with Ryvita Protein. Each crunchy slice is baked with pea protein (alongside rye of course) and topped with red quinoa & sesame seeds. *Protein contributes to the maintenance of muscle mass and the maintenance of normal bones as part of a balanced diet and healthy lifestyle. Ryvita Protein is high in protein. We believe healthy living is all about packing in as much good stuff as possible. Like crunching on Ryvita Protein*, focusing on how good you'll feel after that run, or just saying "yes" more often. There aren't any rules. Well, maybe one. Do & eat things that make you feel good. Protein contributes to the maintenance of muscle mass and the maintenance of normal bones as part of a balanced diet and healthy lifestyle. Ryvita Protein is high in protein. 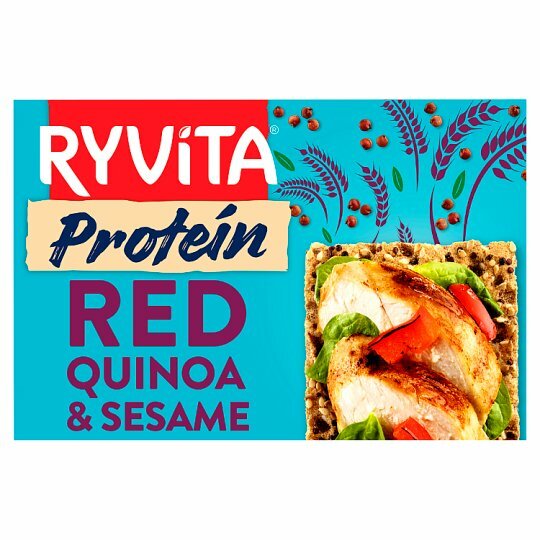 Why not try Ryvita Protein with grilled chicken, spinach & a splash of balsamic glaze?